Didn’t I just give you all an update? Well, I walked you through, but there are other elements to what is happening here. Like trimming and pruning old big trees. I didn’t tell you about that, did I? Coming to this garden most of the great old trees were gone. This area is known for its savannahs of Burr oak and Hickory. What did the people who owned this place previously plant and retain? Can you guess? Silver maples. Read and weep. I don’t hate them, but they are low on my list of what I desire to have in an ideal landscape. However we work with the hand we are dealt. I have a number of old silver maples on the lot and my husband (…now that he occasionally has been mowing with the tractor- it is quite amazing what you notice perched way up on the tractor seat) noticed a large division forming in a forked trunk. For years he has been concerned about the old maple that is planted much to close to the house, but which I appreciate for its cooling effect. After the past years storms, which damaged homes and trees in our area, we decided it was time for a professional opinion. Good at researching and asking around, my husband found an arborist, who I was pleasantly impressed with. 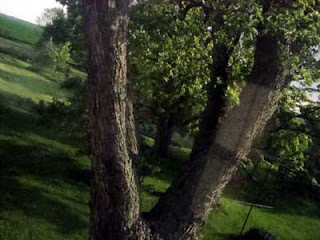 He suggested trimming out lightly and using a wire brace for the tree mainly in question, and simply getting rid of dead wood and lightly pruning back some of the overhanging branches of the big old tree close to the house. I think we will be getting the work done this fall. We talked over my neighbors butcher job of her large maple ( he had been consulted on that, but I guess his advice wasn’t aggressive enough). Heading back a large tree to mere stumps of its branches seems just a sin. It was in need of help, but that severe of a pruning all at once seems like a death knoll. I am getting ready to move some shasta daisies that were much too large for their place, one of the ‘Dreamcatcher’ beauty bush that I had in a holding garden will join them. That is on the schedule for later today. The unseasonably cool weather has been wonderful for working in the garden. I am feeling like I am making progress in cleaning it up- it had gotten pretty weedy and everything was splayed out in a most unattractive way. Judicious pruning is helping immensely. Ok that is it for now… I am envious of Bren‘s produce poundage which keeps climbing every time she posts it on twitter. She is cooking up a storm and takes pictures that belong in a food magazine. half during a major storm and its downpour….a very big limb(half the tree!) fell on my fence. smashed it. leaving the old grandmothers alone. a limb in my bed…pruning is good. I came over to join you as a follower. Thank you for joining and I hope you will come by often and leave lots of comments so I can get to know you. I am learning HTML stuff on my own as well. My hubby is in school so I can’t ask him right now. I need to ask you some questions about how to set up my menu bar. All the info I have found tells me to do a post and enter the info but it doesn’t look “real”. I have also tried figuring out how to get both of my side bars on the right side. How did you do that? Yowie, Joanne! Glad it didn’t fall on your house! Cheri- Blogger code is more than the usual html and really bothers me to work with- I tweak things, but the basic code comes from a free template that is set up to work like I envision. I used to do everything myself when I used a Movable type blog, but with Blogger and WordPress I adjust the free templates that are available. One thing that really helped me with blogger is using a “dummy page” to get my new template working. Otherwise changing things can be a major headache.